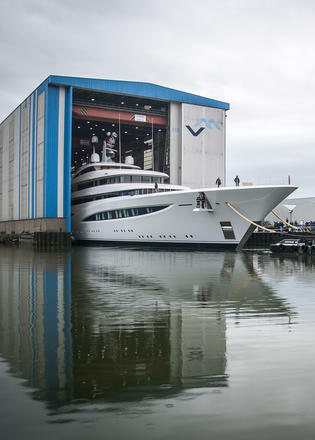 After enjoying her debut season in the Med, the 96.55 metre Feadship superyacht Faith has returned to the Dutch yard's Makkum facility for winter works. Upgrades will include a second wellness area on the bridge deck and more wind shading on the aft decks, while the window boxes on the main and bridge decks will be given a new varnish walnut finish. Exterior styling is courtesy of British design studio Redman Whiteley Dixon and Faith features naval architecture by De Voogt. 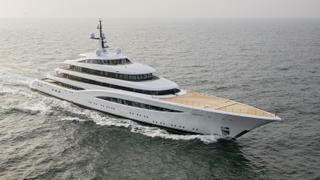 Meanwhile, Azure Naval Architects provided project management services. Accommodation is for 18 guests and 32 crewmembers, including a master suite, two VIP cabins, four double cabins and two convertible rooms. 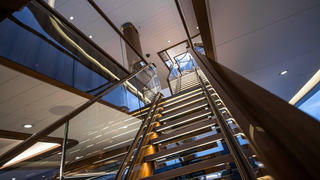 The main-deck owner's cabin features 180-degree views out to sea and a three metre high skylight directly above the double bed. 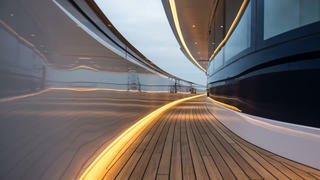 The interior décor was created by the Parisian studio Chahan Design, which is making its debut in the superyacht world. Standout features include the floating staircase and double-sided fireplace, finished in limestone and quartz. 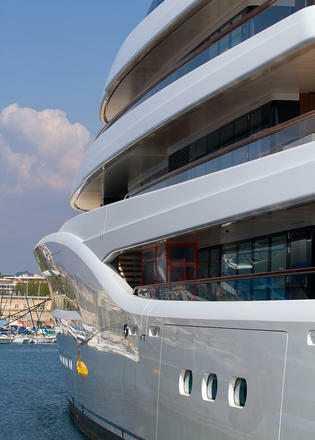 The enormous foredeck on Faith includes a superyacht helipad that is large enough to not only land a Bell 429 WLG, but can also open up to provide sheltered helicopter storage in a concealed hangar. Sweeping hull lines draw the eye to the aft deck where Faith boasts a glass-bottomed swimming pool that is fed by a waterfall and measures up to 2.5 metres deep. 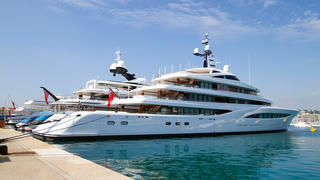 From the fold-out superyacht superyacht beach club below guests can see all the way up to the sundeck, which features a gymnasium and pizza oven. 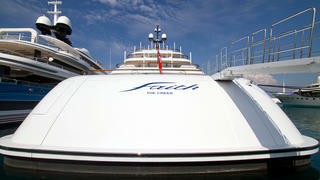 Faith features a 14.5 metre beam, a total interior volume of 2,999GT and 900 square metres of guest areas. Power comes from a pair of 3,000hp MTU 16V 4000 M63L diesel engines for a top speed of 17 knots, and the total fuel capacity of 222,000 litres allows for a cruising range of 5,000 nautical miles at 12 knots. Other projects under development at the Dutch yard include the 110 metre flagship yacht Feadship 1007, which is due for completion in 2018.